SINGAPORE, Apr 16, 2015 - (ACN Newswire) - Picture this: you are going on a long trip and will be spending at least two hours on the road. You begin downloading songs onto your mobile device and then a pop-up appears. "Memory full. Please manage your storage in Settings." Online entertainment is moving from downloading to streaming on both PC and mobile devices for various reasons. The convenience and ability to cherry-pick your favourite content is already a good draw, but the true irresistible power of such streaming services comes from freeing up on storage space. You no longer have to pay for songs, instead you pay for access to a vast library of songs - a number much larger than a single device could conceivably store. Not only does Asia have high mobile penetration rate, it is in fact, a growing mobile-only market. That is, mobile is the only connected device for many Asians, and the desktop experience is completely skipped. In Singapore for example, almost 70 percent of Spotify's audience is between 18-34 years old, and over 70 percent are either a mobile-only or cross-platform user. With that, Spotify was launched in Asia with mobile as a priority, not as an afterthought or nice-to-have. Since Spotify launched its mobile-free tier in the region in December 2013, mobile streams have gone up to as much as five times compared to the previous year. Looking at the numbers, the mobile-first strategy has also fuelled growth in Spotify's user base, which subsequently bumped up premium subscriber numbers at an average conversion rate of about 20 per cent. "We're so committed to the freemium model on mobile because we completely agree with the labels that subscribers are key to bringing the industry back to health - and we need the free 'funnel' to drive subscription," said Sunita Kaur, Managing Director, Asia, Spotify. "By bringing listeners into our free, ad-supported tier, we migrate them away from piracy, which is rife in this part of the world." For Spotify, the other obvious advantage of going mobile is the ability to provide personalised recommendations to music fans. "We are constantly charting and looking at usage data to provide users with a more comprehensive experience. We recommend music depending on what you are already listening to and curate playlists that fit every activity - whether you're at a party, driving to work or studying, we have playlists that are with you at each moment. For example, we partnered with The Music Run(TM), and developed a digital tool that allows all music runners to listen, vote and share their favourite tracks," added Kaur. The result of tailoring the streaming experience to individual needs is that users are spending an average of over 160 minutes listening, dancing or singing along to Spotify every day. Spotify believes that their best marketer has, and always will be, their users. By first considering the demands of the consumers, words about Spotify spread and profits eventually followed in the form of subscriptions and advertisements. Elaborated Kaur, "Evidently, both our advertisers and 60 million active users are extremely important to the long-term survival of Spotify, and the music industry at large. We want to help brands connect to this engaged audience in a variety of ways, while ensuring that these advertisements will be more interesting and useful to consumers. Whether it's advertising on our platforms or even co-creating campaigns that help brands tell their story through Spotify, we are the ultimate cross promotional tool." In second quarter of this year, Spotify is announcing the roll out of a new video ad product. Sponsored Sessions give brands ownership of 30 minute ad-free mobile sessions. Users opt-in to an ad-free experience by viewing a 15 or 30 second video on their mobile device. 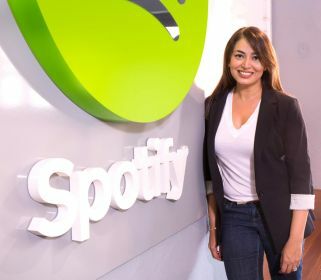 Kaur recalled what Daniel Ek, CEO and Founder of Spotify once said in an interview, "The reason I started Spotify was not because of my love of music. It was because I saw an opportunity to create something that made it easier for people to do the stuff that they were already doing, but legally." "That is precisely the advice I will give to any brands deliberating a mobile strategy. There is no cookie-cutter approach, so consider if your mobile strategy will add value to your consumers' lifestyles. Learn to build for the user, go beyond mobile-first, and go user-first," concluded Kaur. For more insights on how businesses can implement a mobile marketing strategy, join Sunita Kaur, Managing Director of Asia, Spotify, at CommunicAsia2015 this June. Spotify is an award-winning digital music service that gives you on-demand access to over 30 million tracks. Our dream is to make all the world's music available instantly to everyone, wherever and whenever you want it. Spotify makes it easier than ever to discover, manage and share music with your friends, while making sure that artists get a fair deal. Spotify is now available in 58 markets globally with more than 60 million* active users, and over 15 million paying subscribers. Since its launch in Sweden in 2008, Spotify has driven more than US$2bn to rights holders. Spotify is now the second biggest source of digital music revenue for labels in Europe, and the biggest and most successful music streaming service of its kind globally. * Users active within the previous 30 days.